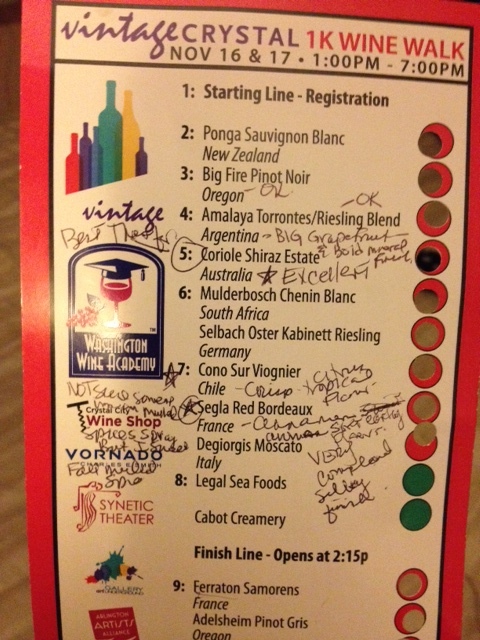 It’s been two years since I last participated in the Crystal City 1K Wine Walk. I’m filled with excitement; especially since the 2013 New Jersey Harvest Wine Festival resulted in no wine purchases. My taste buds are ready to be enticed, spending some quality time with my new-found wine lover and “My Jewel” is serving as the designated driver. They fed us well. Food from Hill Street Blues pull pork barbecue and cornbread, Legal Seafood clam chowder (pronounced in a Bostonian accent 🙂 ), Cabot Creamery and California Tortilla guacamole and tortilla chips – YUMMY! Station 6 volunteer took pity on us, realizing the Mulderbosch Chenin Blanc she pulled out of the cooler was too cold. Doing the unthinkable, I down the Chenin Blanc, so she could immediately pour the Riesling. I should have passed on the Chenin Blanc, the flavors were absent. Coriole Shiraz Estate – Australia – Best red thus far – EXCELLENT! Cono Sur Viognier – Chile – crisp, melon and pear flavors – GOOD! Segla Red Bordeaux – France – Sniffing deeply there’s bold aromas of cinnamon. I look around to see if someone has a sweet cinnamon bun close by. No one else smells cinnamon. The aromas can’t be from the wine. In the middle of a crowded room, with my eyes closed, I sniff again slowing taking in the aromas of cinnamon and wonderful fall spices. OH MY! Eagerly, I sip and soft earthy flavors linger on my palate. Segla is a delicious full-bodied complex red wine. AMAZING! Santa Julia Sustainable Malbec – Argentina – After tasting Santa Julia Viognier at Vapianos, I had to taste the Malbec and it was DELICIOUS! The only Virginia vineyard at the event was Jefferson Vineyards. I wonder if this was due to invitation or lack of response from other Virginia wineries. Besides the long lines, Vintage Crystal 1K Wine and Beer Walk was a great way to spend a Saturday with friends. 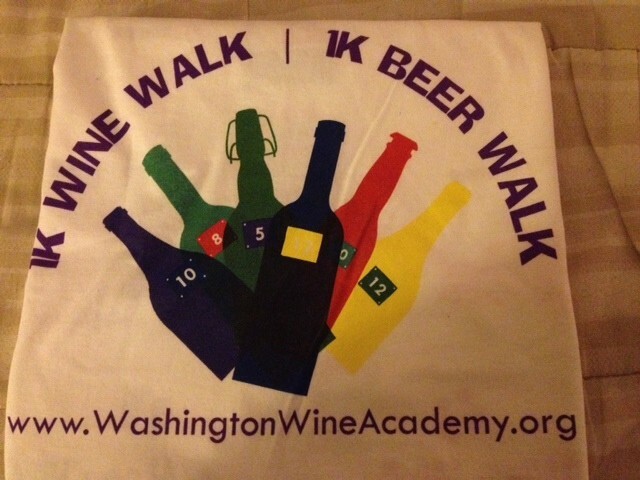 Thank you Washington Wine Academy!